This was an awesome cabin especially for the price. I read some of the reviews and was kinda leary about it but to me it wasnt that small Everything was clean and had everything we needed at the cabin the view was amazing. The decor was cute and the furniture was nice. We will definately come back and I highly recommend it. The road up is steep but we made it up in our car fine. Me and my wife had a wonderful time here at Hilltopper cabin. The road was a little sketchy at first but we made it up in our Nissan Altima. I can see if there was some snow, might have been an issue. SUV or truck recommended. The view was amazing and the location was nice as well. Not too far from Pigeon Forge where we spent most of our days but it was nice to be away from the city. Definitely recommend Cabins USA, as the cabin was very clean and had all the amenities we needed. Will be using Cabjns USA for our future vacations in the Pigeon Forge area. Cute. A bit tiny but knew that going in. Perfect for quick family trip mainly to Dollywood. Not a great “hanging around the cabin” cabin if you have bad weather. No internet - odd since must seem to. Clean, felt new and was good value for the point of the trip. Wish you didn’t have to go through the whole “sign up “ process for on line check in if you have used this company before. Why can’t you save a profile and if there aren’t changes, apply that to any new booking? Also wish “administrative fee” would be waived if you book 3 or more times or year. Something to reward regular return customers. The view was spectacular.... it was very clean and cozy ... we will be back. thank you so much we loved it . The driveway to the cabin was very steep and this was not indicated in the description. We were driving a F150 truck, but if we had been driving my Honda Accord, it would have torn up the underside of the vehicle. I think this information needs to be provided in the description of the cabin. Conveniently located! Far enough away to escape all the noise and traffic from, but yet close enough. Everything worked as expected, cabin was cleaned. One of our favorite cabins, will definitely be coming back. Hilltopper is beautiful! Better than we were expecting , the view from this cabin is amazing, I was expecting a bad road up to it we made it up the hill in a Charger it's not that bad! We had 11 Turkeys in front of the cabin one morning. Ive been renting cabins for years now and I must say we all loved this cabin. It could use a few more cooking utensils but besides that this place is great! It's a very nice property with a very open view of the mountains. It is a steep grade getting up to the cabin so make sure that your vehicle is well maintained before booking. My family is from Vermont so the narrow dirt road didn't bother us. It was just plan your day and spend your evenings at the cabin. The space in the cabin is nice. There are two bedrooms; one in the basement area with the screened in porch with hot tub. We saw a small bear!! He just walked through checking things out one night, then went down the trail. We had kids with us but the cabin is set on a peak where it is a drop off (both sides of road) so it's not a kid friendly lawn area. We really did enjoy our time there and didn't have any problems. It is the true TN! We stayed for our honeymoon and live in Tn just 45 mins away. We loved the cabin and had a great time. The pool table was a little off level. But we still had a blast we will be going to this cabin again in the future. The view was magnificent & we enjoyed our stay.The cabin could use a few more cooking essentials and dish clothes. It could also use a good overall cleaning, especially dusting. This was the fifth year in a row that we have used CABINS USA and 4th year at the Hill topper cabin. We really enjoyed our stay and look forward to returning next year. The only negative during our stay was that the cabin next to us was under construction and repairs. I understand the cabins need to be updated and fixed but would have liked to have been told of this before our stay. I come to the mountains each year to get away from noise of every day life. One whole day the workers were cutting tiles out side which was very loud and distracting. Thanks. The cabin was very clean & comfortable. It had a fantastic view & was in a very quiet area! Our first night we noticed we did not have any hot water & they sent maintenance out within an hour to repair the issue. I would recommend this cabin for couples and/or families! No hangers in closet or hooks ANYWHERE in cabin for hanging towels, etc. My boyfriend and I spent our 1 year anniversary here. The cabin was just what we expected. The view was amazing and the first two days great weather. Th The road was expected due to previous reviews , we drove a Chevy Cruz and it got up the gravel hills just fine. Loved the location close to everything and that helped after a long day out. Overall this cabin made our anniversary trip memorable. The cleaning service flushed soap down the toilet causing the toilet not to flush. We called and you all sent someone right out. Went to the grocery store got back and there was water in the refrigerator and not cool. I called and you all sent me a mini refrigerator right out. Other than that our stay was wonderful and we will definitely come back. Thank you all for a wonderful time in the Smokies. We Loved the property and the location. Although, if we didn't have an all wheel drive vehicle we might not have been able to make it to the cabin. But that was expected after seeing the previous reviews. We did have an issue with the bathroom sink not draining and the shower curtain was not as clean as we thought it should be. There wasn't quite enough room to play all the way around the pool table, but again we knew that from previous reviews. The bed wasn't real comfortable, but after going all day on the town it didn't matter to us. The views were spectacular from our cabin and overall we had a wonderful experience! All of the negatives that we had experienced just made for a more fun and interesting experience for us. Thank You CabinsUSA for helping to make our Smokey Mountains vacation a great one!! The cabin was nice we had a problem with the toilet not flushing so I called and they sent someone out to fix it. The views are beautiful just wish they had a few curtains up but nice cabin.The drive up to the cabin is not bad we had no problem with our Camry just have to be careful. I highly recommend Cabins USA I used the express check in and check out no problems at all will definitely use them for our trip next year. Our stay was wonderful, what a great place to spend our honeymoon! Such beautiful views from this cabin. Very comfortable with great amenities. Loved how close we were to Pigeon Forge and Gatlinburg but still secluded enough to enjoy the mountains and wildlife. Great value for the money. We had such a great time, can't wait to come back and enjoy the area again! Thank you for all of your kind words! We here at Cabins USA strive to give each of our guests the same great stay you enjoyed while vacationing in the Smokies. When you are ready to stay with us again, please mention you are a return guest for an additional discount. Thank you for choosing Cabins USA and we look forward to seeing you again soon! The Cabin was exactly the way it was described in listing. Beautiful view and fit our needs for the week perfectly. The drive up is steep, and I was thankful my husband was driving it, he seemed to enjoy it! Somewhere along our travels on the day before we were leaving, we picked up a nail in our SUV' s tire. We came out of cabin to head into Pigeon Forge and our tire was flat as a pancake! We had not packed the spare because we needed the space for luggage, ughhh. There happened to be a cabin maintenance guy, Anthony, servicing another cabin and my husband went over to ask him for help. Anthony drove my husband down to town to get air put in the tire and brought him back up to the cabin with it. What a blessing he was to us! We had a wonderful experience with Cabins USA. Thank you! Thank you for all of your kind words! We here at Cabins USA strive to give each of our guests the best stay possible while vacationing in the Smokies and our employees appreciate being recognized for their excellent customer service. When you are ready to stay with us again, please mention you are a return guest for an additional discount. Thank you for choosing Cabins USA and we look forward to having you as our guest again soon! Great cabin with a gorgeous view. Staff were friendly and helpful and directions to the cabin were easy to follow. Nice amenities at the cabin, though some areas could use some updating or more thorough cleaning (rusty fridge/freezer and mildewed shower curtain). Observation: The pool table is probably not a great idea - It's an accident waiting to happen (pool cues banging the wall/window or a ball flying off the table is not unheard of in pool). It's in a too small space and it was frustrating to play even one game. Thank you for all of your kind words! We here at Cabins USA strive to give each guest the same great stay you enjoyed while vacationing in the Smokies. I apologize for the cleanliness issues you experienced during your stay. Your comments have been forwarded to our housekeeping supervisor to be addressed. When you are ready to stay with us again, please mention you are a return guest for an additional discount. Thank you again for choosing Cabins USA and we look forward to seeing you again soon! Thank you for taking the time to let us know about your recent stay in Hilltopper! We here at Cabins USA work hard to make sure each of our guests have the best stay possible while vacationing in the Smokies. When you are ready to stay with us again, please mention you are a return guest for an additional discount. Thank you again for your review and thank you for choosing Cabins USA! The cabin and the view is beautiful...but the drive up to the cabin ruined it for me. We were on our honeymoon and drove up at night after our 9 hour drive and it was so terrifying for me that I didn't want to go back down. Now, during the day time it wasn't as terrifying but still really bad. We only went up and down once a day because we were scared of our car not making it. Gravel, bumps, incline--it was much worse than we thought it would be. If you're used to driving in that then I do recommend this cabin because it is beautiful, it was just ruined for us with the drive. Nervous to book with CabinsUSA again because of this unclear drive up to our cabin. 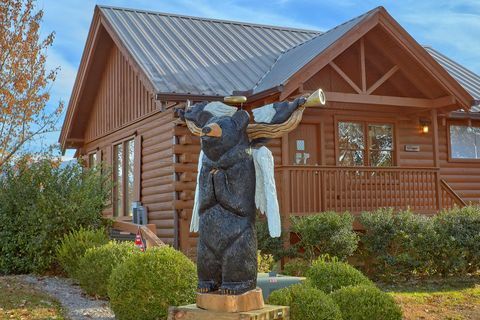 This cabin was perfect for our stay, the location was good, great view, not far from Pigeon Forge, bird chirping every morning, didn't need no alarm clock lol, we really enjoyed our stay, just wished it was a longer stay. Thanks Cabins USA!!! I am so happy to hear that you enjoyed your stay in Hilltopper! We here at Cabins USA work hard to make sure each of our guests have the same great stay you enjoyed while vacationing in the Smokies. When you are ready to stay with us again, please mention you are a return guest for an additional discount. Thank you again for your review and thank you for choosing Cabins USA! We stayed 4 nights the cabin is in great condition very clean, the drive up there was steep its a gravel road and takes about 7 minutes to get up there we have a sedan so it was always a little scary for us, i have 2 small kids and i was most amazed with the cabel tv in the cabin the kids were able to watch all they're cartoon channels. The kitchen is fully equipped and in great condition. The master bedroom has a connection to the bathroom and the king size bed was pretty comfortable. The room downstairs is ok for adults not for kids since its on the lower level. The 1st night we arrived the water heater wasn't working we had to heat water in pans and shower that way but the following morning when we called maintenance came right away to fix it. Overall we were very happy the views in the morning are spectacular. We would stay here again!!!! I am so happy to hear that you enjoyed your stay in Hilltopper! We here at Cabins USA work hard to make sure each of our guests have the best stay possible while vacationing in the Smokies. When you are ready to stay with us again, please mention you are a return guest for an additional discount. Thank you for choosing Cabins USA and we look forward to having you as our guest again! We truly enjoyed our stay. The cabin was beautiful and clean. All the appliances worked and had no trouble at all. There was some traffic noise you could hear from the deck, but the view made up for it. We will definitely come back! The cabin was beautiful and in a great location! The cabin was super clean and perfect for us for a weekend getaway. The only thing that was some what of an issue is the drive up to the cabin. It's a gravel road straight up the mountain and it was really washed out and had huge potholes in it. I drive a Chevy Cruze and my car bottomed out going up the hill in one spot. I would recommend fixing the driveway up to the cabins for sure. Other than that I will come back again! Thank you for taking the time to let us know about your recent stay in Hilltopper. Our cleaners work hard to make sure each of our cabins are thoroughly cleaned and fully stocked so all our guests have to do is walk in and start relaxing. Thank you for letting us know about the condition of the road. Your comments have been forwarded to our Owner Liaisons. They will be bringing this to the owner's attention. When you are ready to stay with us again, please mention you are a return guest for an additional discount. Thank you again for your review and thank you for choosing Cabins USA! A beautiful view, just a little slight problem with the ants. But overall everything was worth it. Thank you for taking the time to let us know about your recent stay in Hilltopper! We here at Cabins USA work hard to make sure each of our guests have the best stay possible while vacationing in the Smokies. Thank you for letting us know about the issue you experienced with ants. Maintenance has been notified and will be correcting that issue. When you are ready to stay with us again, please mention you are a return guest for an additional discount. Thank you for choosing Cabins USA and we look forward to having you as our guest again! Cabin was in a great location, central to everything. Road up to cabin is quite steep, but was fine to get to. Cabin was clean, but floors could use a good scrub! Kind of strange that there are no curtains or blinds in bedroom downstairs, lots of windows and very bright very early in the morning! View is like no other. Had a great time. Thank you for taking the time to let us know about your recent stay in Hilltopper. We here at Cabins USA work hard to make sure each of our guests have the same great stay you enjoyed while vacationing in the Smokies. I apologize for the cleanliness issues you experienced. Your comments have been forwarded to our housekeeping supervisor to ensure they do not happen in the future. When you are ready to stay with us again, please mention you are a return guest for an additional discount. Thank you for choosing Cabins USA and we look forward to having you as our guest again! This was our third visit to your cabins in the last 3 years. Had a great time. I am so happy to hear that you enjoyed your stay in Hilltopper! We here at Cabins USA work hard to make sure each of our guests have the same great stay you enjoyed while vacationing in the Smokies. Thank you again for your review and we look forward to having you as our guest again! We LOVED our stay at Hilltopper! The BEST view by far of any cabin we have ever rented. The road was a little washed out in areas and probably needs grading. The wildlife was entertaining and exciting.... especially the bear, whom we named Blackberry because it was in the blackberry blooms. We got great pics of it from the deck and windows. Rabbit, turkey, hawk and other critters were our visitors too. We are considering staying here again in the Fall when the leaves are changing colors. Cabins USA is #1 in our opinion! I am so happy to hear that you enjoyed your stay in Hilltopper! When you are ready to stay with us again, please mention you are a return guest for an additional discount. Thank you for choosing Cabins USA and we look forward to having you as our guest again! We have used cabins USA every time we travel to Pigeon Forge, TN. The Hilltopper cabin was amazing. My kids 10 and 4 loved the down stairs room. They loved looking out at the mountain views. We absolutely loved this cabin. I am so happy to hear that everyone enjoyed their stay in Hilltopper! We here at Cabins USA work hard to make sure that each of our guests have the same great stay you experienced while vacationing in the Smokies. When you are ready to stay with us again, please mention you are a return guest for an additional discount. Thank you again for your review and thank you for choosing Cabins USA! The view from this cabin was so worth our stay here. Cabin was very clean. The pool table was probably not the best selection to put into the cabin. There was no room to even shoot the balls on the table. But we were not there for playing pool. Sat out on the deck the majority of the time just relaxing and taking in the beautiful view. The mattress on the king size bed is getting worn a bit. All in all...we would stay here again!! Thank you for taking the time to let us know about your recent stay in Hilltopper! Our housekeepers work hard to make sure that each of our cabins are thoroughly cleaned and fully stocked so all our guests have to do is walk into their cabin and start relaxing. Thank you for letting us know about the mattress. Your comments have been forwarded to our Owner Liaisons and they will be speaking with the owner of the cabin regarding that issue. Thank you again for your review and thank you for choosing Cabins USA! My husband and I had a wonderful vacation. This was our first trip away without our kids (23 and 22). The views from this sweet little cabin (Hilltopper) were breathtaking. We are looking forward to coming back and staying in another cabin from Cabins USA. The staff were very friendly and the cabin was clean. Thanks for a wonderful trip. Thank you for all of your kind words! Our staff works hard to make sure that each of our guests receive the same attentive customer service you experienced when staying with us. When you are ready to stay with us again, please let our reservationists know you are a return guest for an additional discount. Thank you again for your review and we look forward to having you as our guest again! Our stay in this cabin was perfect. I didn't want to leave. The cabin was clean, and very cozy. The view is incredible and it is so nice to wake up to each morning. The drive up to the cabin is easy. We were in a car and made it up the hill in the rain just fine. I would definitely recommend this cabin and will be staying with cabins USA again soon! Thank you so much for all of your kind words and I am happy to hear that you enjoyed your stay in Hilltopper! We here at Cabins USA work hard to make sure that each of our guests have the same great experience you enjoyed while vacationing in the Smokies. When you are ready to stay with us again, please let our reservationists know you are a return guest for an additional discount. Thank you again for your review and we look forward to having you as our guest again! A few things would have been helpful. A box of tissues, things like salt & pepper etc. The blinds for front window was missing. This is needed. It would have been a good idea to provide for privacy by putting blinds for kitchen window as neighbors can see clearly. Similarly blinds for the window next to the pool table. The jacuzzi in the bathroom was a small one barely fit for a large person. The Hilltopper has an absolutely spectacular view. The cabin was clean and pretty easy to get to. Our only disappointment was the pull out bed. It was so uncomfortable that my teenager chose to sleep on the couch rather than the pullout. This was our second cabin with Cabins USA and we were very happy with the service as we were with our first stay. Finally, I reiterate, the view from this cabin was absolutely spectacular! It was a great cabin to stay in and the view was breath taking. We enjoyed our stay at the Hilltopper we rented with Cabins USA. What you see on the website is exactly what you get. The view was amazing!! We will definitely stay with Cabins USA again. At first we worried that our old Mustang wouldn't make it up the mountain side but we had no problems and I would recommend this cabin to anyone. Thank you to the friendly staff who assisted us with our stay with Cabins USA. The cabin is very nice inside. It has everything you need for your stay.The views are beautiful! Getting to the cabin is a bit challening but worth it. My only problem was the jacuzzi. When you turn it on it had back stuff coming out of it.We called to have it taken care of, and they said someone would be out to fix it but they never did. Thank you for taking the time to write your review. We are glad that you had a great stay with us at Hilltopper. We apologize for the inconvenience you experienced with the jacuzzi. We have passed this along to the correct department to insure this is addressed immediately. We appreciate your feedback on your stay with us, and we hope that we will hear from you again. Do not forget about our return guest discount. Was really nice! So peaceful. It definitely needs a porch swing though. Not having one took away from the cabin to us. It doesn't have a hot tub and the pool table wasn't level. So all the balls rolled to one side. The cabin is very beautiful we would like to come back...if they add a swing. Thank you for your review. We are delighted you had a great time with us at Hilltopper. We apologize this cabin did not offer every amenity that you wanted for your getaway. Please feel free to give us a call for our future stay and allow us to help you find the perfect cabin in the Smoky Mountains. the property was excellent but problem was road going up to cabin. I should have been told road was very bad dirt road. it was very narrow in certain area. If I was told i made have change cabins or except the cabin but choice was mine. Thank you for your review. We apologize you were not made aware of the road condition leading up to the cabin. We do always encourage our guests to call with any questions. Again, we apologize and we will be more than happy to assist you in the future booking a cabin with different road conditions. We hope to hear from you again soon. We enjoyed our stay in Hilltopper. It was awesome to be away from town, where we could sit down and actually relax at the end of the day. It would have been nice if there was a hot tub in the screened in area of the cabin. It looked as though there were outlets ready to accommodate one. The only problem we had was with the hot water. We had hot water everywhere but the shower until we read the guest book. The hot & cold water is switched in the shower. :-) We had a great time and we would definitely book a cabin through CabinsUSA again. Cabin was fantastic for the price! The only concern I have is the lack of warning about the driveway. It is very steep and rough. We managed to make it with little problem in a full size van but not all people may be okay with driving up this driveway. It made me nervous!!!! Water froze on our last night but we were taken care of promptly. Molly is wonderfull and we always call Cabins USA for our cabin needs. This was the perfect place for us. We loved being on top of the mountains.The view is beautiful.We will be back.If you love sitting on a porch and looking at the mountains this is the cabin to be in.The cabin was beautiful also. Other than a little bit of dust, the cabin was quite clean. It could use some steak knives (only one in the drawer) and maybe some wine glasses. Overall, we were very happy with the cabin and would definitely recommend Cabins USA and the Hilltopper! Jim E., Ft Valley, GA. The cabin was very nice. We did have a little trouble after a bad storm, but the staff was friendly and worked well to accomadate the problems. Part of the problem was fixed, others were not, and almost seemed to be ignored. However, everything else was great! They even helped us when I had a check-out date confusion and fixed it for us! My family and I have been coming to Pigeon Forge for the last seven years and have stayed in hotels and cabins. For the last three years we have been renting from Cabins USA and probably will while we continue to make our yearly trip. We love everything about Cabins USA and will recommend it to everyone we know. Thank you for making our stay an enjoyable one. i guess the only complaint i have would be there was only one bathroom. I was sort of surprise with it being a two bedroom. But the view was gorgeous. i would stay there again.